You may now add a Contact Us form to any of your public pages, using the new Contact Us widget, as shown in our User Guide. 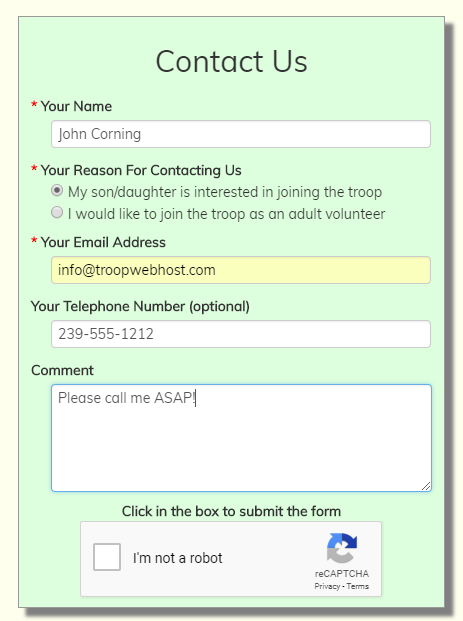 To set up this form, you'll first want to create one or more Dynamic Subgroups that represent the leaders who should be notified when a visitor submits the Contact Us form. Each reason must be associated with a Dynamic Subgroup. When a visitor selects that reason, a message will be sent to the members of the corresponding Dynamic Subgroup. Please note that the reCaptcha box will not display until the first three fields have been entered. We use the reCaptcha box to prevent bots from spamming your site. Maintain Contact Reasons will allow you to add and update the list of contact reasons. Maintain Contacts will allow you to view the list of contacts submitted by visitors. These tasks have already been assigned to the "Site Administrator" and "Membership" roles on your site. Authorized users will now see an Upload Photos button when they select an event from the calendar.